Why are our customers switching to megapixel technology, or at least examining this option? The main reason is "price". That probably sounds confusing since the conventional wisdom is that a reliable, industrial-quality megapixel network surveillance camera is four or even five times more expensive than comparable low resolution (4CIF) security cameras systems. How can the megapixel camera system cost less? Scenic Coverage: These are applications; often live viewing, where you don't need detail on recorded video. For instance, you may be watching a road and looking for traffic jams but do not need to read license plates. Or you may be looking to see what a crowd is doing but do not need to recognize faces. You may want to detect when someone is in a restricted area so you can respond immediately. Event Coverage: These are applications where you need to see, record, and recognize images like car types and people, so you can go back "after the fact" and determine exactly what happened. I.D. Coverage: Applications where you need positive identification of individuals, read a license plate number, and also read the model of the car. In a retail or banking context, you need to clearly see the customer's and employee's faces as well as identify the currency in their hands. By assigning a coverage category to your application you are, in fact, defining the resolution requirements. With older surveillance technology, resolution was defined by its TVL (television lines, a.k.a. total video lines). Over the last few years the market has evolved into defining resolution by the total number of pixels. This is more objective when comparing products that have different resolutions. So, when an image is 640 x 480 pixels, that is actually 640 (horizontal or columns) pixels x 480 (vertical or rows) pixels, for a total of 307,200 pixels, or approximately 0.31 of a megapixel (million pixels). But resolution can only be defined by pixel if you determine how wide an area those pixels will be covering. How do we determine that? It's all about pixels-per-foot. For general scenic surveillance applications, you need approximately 20 pixels per foot. Forensic applications require about 40 pixels per foot, and I.D. applications demand at least 80 pixels per foot. Once you have defined the type of application you have, and you know how wide an area you have to cover, you can figure out if megapixel is right for you. An example will make this much clearer. Let's say you want to cover a parking lot with forensic detail and the lot is 100 ft. wide. For simplicity, we will only discuss here the width (horizontal field of view). For a true analysis, you need to factor in the width and depth. 100 ft. x 40 pixels/ft. = 4,000 pixels, which is what you will need to cover that 100' area and recognize license plates and facial detail. Once you have this, the rest is easy. The next step is to determine what resolution cameras you want to use. You determine this by dividing the number of pixels you need to cover the area (in this example, we've determined that count to be 4,000 pixels) by the number of horizontal (columns) of pixels provided by your camera. -- If you use 320H x 240V resolution cameras (0.07 Mpix) you perform the computation by dividing 4,000 by 320. The result is 12.5, so let's put that at 13 cameras. -- At 640 x 480, (0.31 Mpix) you divide 4,000 by 640, and you come up with 6.25 cameras, so we round up to 7 cameras to make sure we've covered the scene fully. -- If you're working with 1280 x 1024 (1.3 Mpix) cameras, the scene would call for 3.25 cameras, Four cameras will surely cover the area. -- As you move up the resolution ladder, you can compare cameras that create images equal to 2048 x 1536 (3 Mpix). Using that resolution, two properly positioned cameras will do the job. As a preview to that discussion, consider that while a megapixel image is certainly larger than a 640 x 480 image, with the smart camera tools available today it is not as large a difference as you would suspect. In fact, with all things kept the same in terms of compression, two images from a 3 megapixel camera typically take up less storage than seven images from a 640 x 480 camera. We intentionally avoided a discussion about compression as there are too many variables to consider. Nevertheless, end-users should beware of companies trying to convince you that they can compress images and not lose image quality. A good practice is to demand that anyone who proposes a system to you submit an actual JPEG image and an 8 x 10 glossy of a moving image captured at your site as part of the bid process. This will help ensure you get what you pay for. Understanding what megapixel video surveillance means for bandwidth. 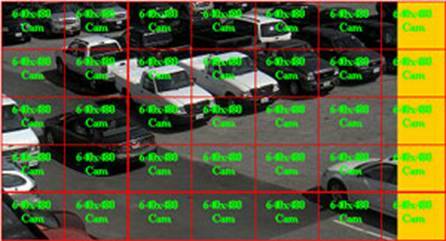 Image 1: In this theoretical example, it would take 35 cameras at 640 x 480 resolution (4 CIF) to cover the parking lot at a forensic level. If we attribute 50kB of bandwidth to each of the 35 cameras, the total bandwidth need would be 1.75MB. 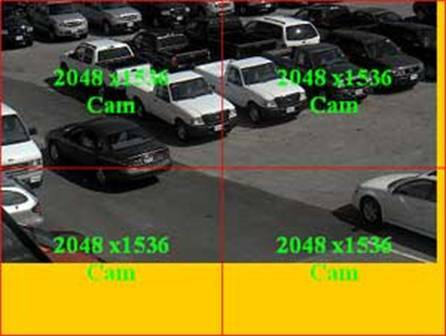 Image 2: In the same theoretical parking lot, four megapixel surveillance cameras operating at 2048 x 1536 (3 Mpix) can give the same level of detail that 35 4CIF cameras would provide, but less bandwidth would be used. Four cameras at 225kB each would equal 900kB, versus the 1.75MB needed in the 4CIF camera design. Image 3: "Choke points", or areas of special interest, are often defined by security system designers. It's these areas which often call for forensic surveillance where a great deal of detail must be captured. 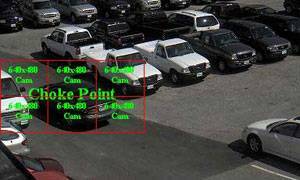 In the same theoretical parking lot, four megapixel surveillance cameras operating at 2048 x 1536 (3 Mpix) can give the same level of detail that 35 4CIF cameras would provide, but less bandwidth would be used. Four cameras at 225kB each would equal 900kB, versus the 1.75MB needed in the 4CIF camera design. 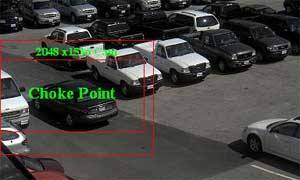 Image 4: Our first option for obtaining forensic video surveillance detail in this choke point is to use 6 cameras operating at 640 x 480 resolution (4 CIF). The result would be a bandwidth need of roughly 300kB. Image 5: The second option for fully covering the choke point is to use a single high-resolution camera at 2048 x 1536 (3 Mpix). The bandwidth in this design would be 225kB. While there are many different types of compression-some of the more familiar being H.264, MPEG4 and MJPEG-there are basically two types: frame-by-frame and Temporal. MJPEG is the most popular frame-by-frame compression technique, compressing each image in its entirety. It is widely deployed and easy to integrate with. The advantage of this technique is that it enables you to recreate images accurately and bandwidth use is predictable. The drawback is that by handling each image in its entirety, it is not very efficient in terms of bandwidth when there is little motion or activity. Temporal is represented by popular compression methodologies like H.263, H.264 and MPEG4. These techniques are widely deployed in applications where the available network bandwidth is limited and low quality images will suffice. Temporal takes an image, called a "key frame," compresses it in its entirety, then for the next few images, only compresses and transmits things that change in the image. Every few images, it takes another key frame and repeats the process. The advantage of this technique is that by sending only changes to the key frame, you can save a lot of bandwidth and storage when there is very little motion or activity. One drawback of this technique is that only the key frame is a true "legal" picture. Another drawback is that motion results in a significant increase in bandwidth consumption, thereby reducing the bandwidth advantage over frame-by-frame compression. But in reality, compression isn't significant for our following analysis, because the examples below will hold true as long as you aren't mixing apples and oranges. This information is about comparing Megapixel cameras with low-resolution cameras to see if and when deploying Megapixel makes sense. In that sense, we are simply comparing different size apples. So, for our analysis we will assume you want the highest quality images available and will, therefore, use a frame-by-frame compression like MJPEG. When does megapixel make sense? Let’s talk again about pixels-per-foot, which helps make the megapixel decision fairly straightforward. We’ll use the same example, but we'll now add depth of coverage as well: we want to cover a parking lot with event coverage detail (40 pixels/foot - this is the resolution at which you can recognize faces and license plates) and the lot is 100 feet wide, but now let's add that we need to cover multiple rows of cars at a depth of 60 feet. To do the math, we multiply the 100 foot width by the 40 pixels/foot to come up with 4,000 pixels. Then we multiply the 60 foot depth of field by 40 pixels/foot to come up with 2,400 pixels. We then multiply those two values (2,400 and 4,000) to produce the total number of pixels needed. In this case, that number is 9.6 million pixels, or 9.6 megapixels. Determining bandwidth is accomplished by simply calculating the size of each image and keeping the compression for all cameras the same. Once you have the image size, you multiply that by the images per second to get your bandwidth requirements. A 640 x 480 image with medium-low compression has a file size of approximately 50kB. For higher resolution images we can use data which shows a typical 3.1 Mpix image will have a 225kB file size. The following examples show what it would take to cover the parking lot with the desired resolution. Option #1 (show in photo column above as Image 1) would require 35 cameras operating 640 x 480 resolution (a.k.a. 4 CIF). If each of those 35 cameras was using 50kB of bandwidth, the total bandwidth needed for this option would be 1.75MB. The second option is to pursue a megapixel application (Image 2 in the photo column). Four cameras operating at 2048 x 1536 (3 Mpix) would cover the scene. If each of those cameras is using 225kB of bandwidth, the total is 900kB. So, an apples-to-apples comparison reveals that megapixel cameras can deliver the same image quality for about half the bandwidth. But let's face it; most people won't employ cameras to cover the entire area. To save money, you are more likely to only use cameras at critical "choke points," so the 35-camera-to-4- camera comparison isn't really practical. Let's take a quick look at a choke point example and see how Megapixel cameras stack up. First, let's define the choke point area; this is the area in which something you want to record is likely to happen (see Image 3). Then, we run the numbers again. Option #1 (Image 4) is to use six cameras running 640 x 480 resolution (4 CIF). At 50kB each, the bandwidth requirement would total to 300kB. The second option (Image 5) is to use a single megapixel camera at 2048 x 1536 (3 Mpix). The bandwidth requirement in that design would be 225kB. This example demonstrates that covering our choke point with a megapixel camera would use 33 percent less bandwidth than using 4CIF, 640 x 480 cameras. As a side note, Surveillance Integration offers megapixel cameras that incorporate smart features such as digital image cropping that allow the user to optimize a camera for a given application. Essentially we can crop out areas of the image that are not needed and save the corresponding bandwidth. In the above example, the choke point is 1920 x 960, so a 3.1 Mpix camera with digital image cropping could be cropped to 1920 x 960 and still cover the area. This should yield a file size 135kB, which would be about 56 percent less bandwidth than what would be used if we were to cover the same area using 640 x 480 cameras. Comparing Digital PTZ vs. Mechanical PTZ for surveillance operations. Here, we tackle the pros and cons of digital pan/tilt/zoom (PTZ) systems vs. mechanical PTZ systems. First, let's talk about some basics of pan, tilt and zoom. Mechanical PTZ cameras consist of motors, slip rings, gears and/or belts and wheels to drive the camera into position. Traditionally, they were controlled by proprietary keyboards but recent advancements in our industry have allowed these same cameras to be controlled by software interfaces. These devices are available as integrated units, most commonly in the form of domes, or you can purchase the camera separately and mount it on a pan-tilt motor. The amount of zoom, e.g. 25X, depends on the ratio of the telephoto setting to the wide angle setting. So, a lens that goes from 4mm to 100mm will have a 25x zoom. A lens that goes from 50mm to 150mm will only provide 3X zoom but will be much better at zooming in farther away because of the 150mm telephoto setting. However that same set-up will not have as wide of a field of view. The lower of the numbers (the 50 in a 50mm-150mm lens) is what you use to know how "wide" your field of view is. The lower the number, the wider angle the lens is. So, in this model, the 50-150mm is more of a telephoto lens, and the 4-100mm gives a wide angle view of the scene. Today, most mechanical PTZ cameras employ low-resolution cameras, typically around 704 x 480 or 1/3 of a megapixel. In order to get high-detail (80 pixels/foot) with that camera, you would need to zoom into an area that is no wider than 8 feet (2.4 meters). If you zoomed out all the way, you would now be spreading those pixels out over a very wide area and would lose almost all detail. If your goal is to give security staff the ability to monitor general activity, and then zoom in over a long distance with good detail, then mechanical PTZ cameras with high zoom telephoto lenses are the way to go but there are a few things you should consider. First, mechanical PTZ cameras should be thought of as "either/or". Because of the nature of lens options, you either get wide area coverage with low resolution or you get high resolution in a very narrow area. You really cannot get both. This means if you are "zoomed in," you will miss everything else that the camera is not zoomed in on. Alternatively, if you are "zoomed out," you won't have the detail you need. If you are recording "zoomed out" mechanical PTZ images you can always "digitally zoom" after the fact, but the real world isn't like "CSI", and the results aren't pretty. This limitation places a great deal of responsibility on the guard controlling the camera, especially if there are simultaneous incidents in which case the guard must decide which is more important.. The second thing to consider is the cost of 24/7 guards dedicated to controlling the cameras-which can be a substantial amount of money. Next, if you are controlling these mechanical cameras over a TCP/IP network, there can be a long delay between when you tell a camera to PTZ and when it actually responds. Finally, mechanical PTZ cameras have a number of moving parts that are susceptible to wear and tear and will eventually require periodic maintenance and repair. The other approach many people are opting for is to use megapixel cameras with digital pan/tilt/zoom. Megapixel cameras, which are commonly offered as IP cameras, are ideal for applications where you don't have the resources to have 24/7 live monitoring of the cameras and therefore, have to rely on the forensic value of recorded video. When combined with the right lens, megapixel network cameras ensure that you will always have enough detail to go back after the fact and have forensic evidence like license plate numbers and facial detail to determine what happened. If you opt for the megapixel network camera approach, the only thing you have to do is make sure you have selected the proper resolution camera and lens to provide you with the desired detail (pixels/foot). Once configured, you can digitally pan/tilt/pan/tilt/zoom around live images without affecting what is recorded, or you can come back in an investigation process and digitally pan/tilt/zoom on recorded video. In fact, thanks to advances in hardware and increasing use of IP communications, multiple people can connect to the same camera at the same time and independently pan/tilt/zoom around Regardless of where someone may be digitally pan/tilt/zooming, you can always go back to recorded video and look at other areas with no loss of detail. Additionally, since most megapixel cameras do not have moving parts, maintenance requirements are minimized. In conclusion, if you aren't looking for both detail and situational awareness at the same time, then traditional mechanical PTZ cameras are a good fit. If you may need both the scene view and the detailed view at the same time, and if you can't allot the funds to staff guards to control your cameras, the megapixel approach is a worthwhile solution. Weigh your needs to decide which video solution is more applicable to your security needs. As you plan your investment in video security, you have many technologies to consider. Our commitment at Surveillance Integration is to maximize your investment. We look forward to the opportunity to work with you.